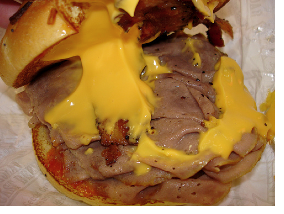 UBS Analysts Cranking Away on "Project Beef 'n Cheddar"
It's possible that this UBS analyst is one of several currently busy modeling scenario upon scenario regarding a possible sale of the well known roast beef sandwich chain Arby's. Recently, UBS landed the assignment to explore a possible sale of Arby's, the restaurant chain now part of the Wendy's/Arby's Group, whose largest shareholder is Brooklyn-born businessman and former Snapple owner Nelson Peltz. Apparently, Peltz is a but underwhelmed by how many regular, medium, and large roast beef sandwiches that Arby's has been able to move. He believes there's more value to be had in solely selling old fashioned hamburgers, Frostys, and baked potatoes stuffed with brocolli, bacon, cheese, and chives. "The way to maximize shareholder value is to focus all of our management and financial resources on continuing to build the Wendy’s brand," Peltz said in a statement. Arby's joins other iconic fast-food brands on the selling block: curly-fry masters A&W and popcorn shrimp pros Long John Silver's.